Hypothermia is a significant health risk for divers and others engaged in water sports. 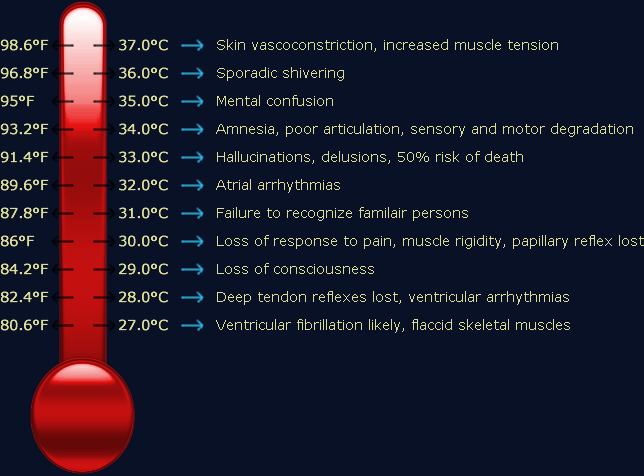 Mild hypothermia may be treated with warm oral liquids and external warming. Moderate hypothermia requires heated intravenous fluids as well as other methods of internal body warming such as warm water bladder and colonic irrigation. Severe hypothermia may require heated fluid peritoneal dialysis as well. The application of external warming in cases of moderate and severe hypothermia without appropriate internal warming methods can result in blood pooling in the extremities with associated central core body shock and possible death. If a diver or other victim of hypothermia suffers a cardiac arrest, then CPR is begun and continued until he is warmed up. No one is pronounced dead until they are warm and dead.